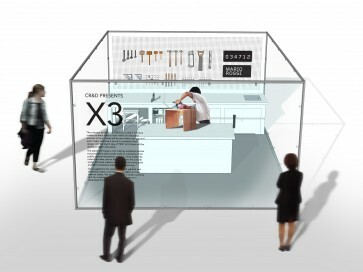 Alex is pleased to be participating in X3, an installation by CR&D, (Creative Research and Development) at Tent and Super Brands 2012. Come and see Alex make a chair in the X3 workshop, a clear cube allowing members of the public to view the process of “design making in action” on Friday 21st September from 1pm till 7pm. Alex can only use the supplied materials and tools and has to complete his design within an allocated amount time of 6 hrs. Japanese Saw – 240mm, Wood Mallet, Hammer, Chisel 20mm & 10mm, Smoothing Plane, Woodworking Vice, 4 Speed Clamps, Square, Tenon Saw. Router, Cordless Drill, Drill Bits and Countersink, Dust Extraction Vacuum. 1 litre each of Blue, Yellow, Red, White, Black water soluble paint, Water, Sand Paper, Sanding Block, Wood Glue, Screws, Pins, Wood Wax, Rags, Paint Brush, Small Tub for Mixing Paint, Duct Tape, Masking Tape. 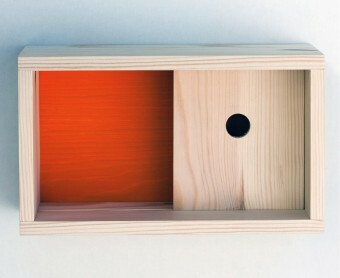 4 Sheets Birch Ply Wood (600mmx600mmx18mm) Prepared Beech (8 @ 25mm x 50mm x 1200mm, 8 @ 15mm x 30mm x 1200mm). 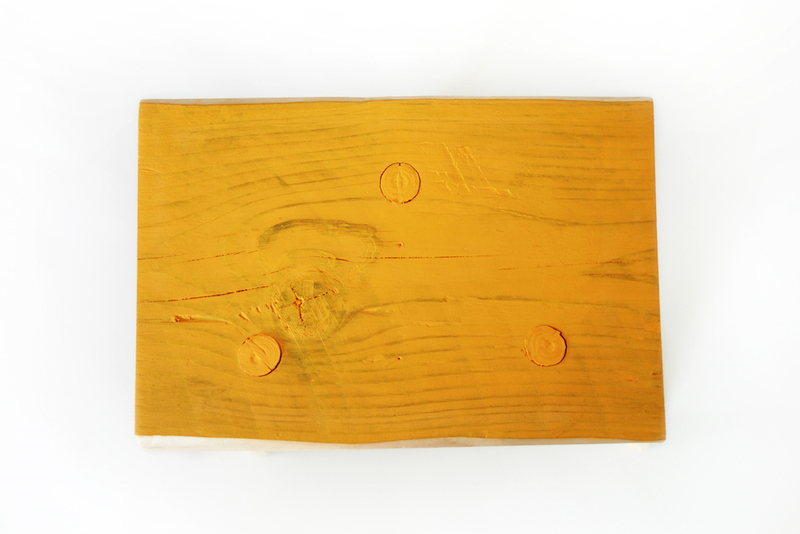 Alex is pleased to announce his participation in The Auction Room an exhibition curated by Mariana Pestana with Designersblock for The London Design Festival. For the Auction Room Alex has created the “Red-Blue Desk” inspired by the ‘Red-Blue chair’ by Gerrit Rietveld. 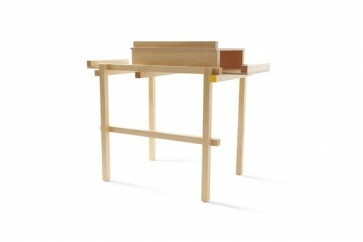 The Red-Blue Desk is presented as a homage to Rietvelds chair and is composed from the exact same generic components used to create the original Red-Blue Chair design. 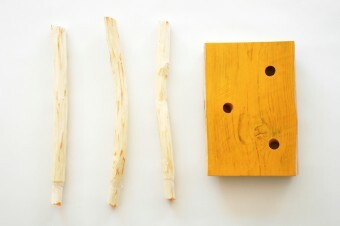 The rectilinear components have been rearranged into what Alex Hellum describes as a “ Rietveld-esk design”. 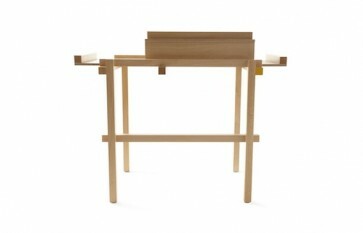 The desk features a subtle reference to Rietvelds design in the form of a discreetly introduced 30mm x 30mm square painted yellow on every elevation as featured on the original design. More than just a modern classic; the Red-Blue Chair is a statement of early modern design with a move away from craft as a means to an end. It is behind the Red-Blue Desk that the auctioneer will perform and on top of it will the gavel firmly hit. After the auction, this piece is to be used as a small writing desk with a raised sliding platform for a laptop or a note pad where you can to hide stationary and other things away beneath it. In this piece, the answer to fake was driven by the idea of copying – with its connotations and creative potential – and processed with the designer’s practical mindset. The exhibition is The Auction Room. 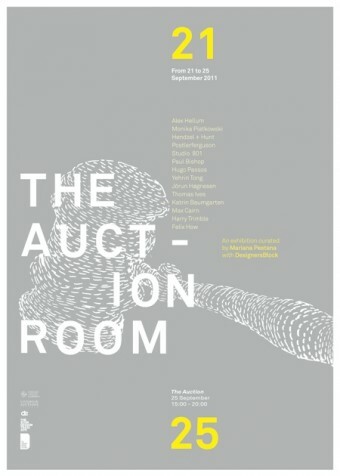 The Auction Room is the exhibition. All the elements, from the chairs to the hammer have been made by exciting designers and are up for auction. Visit the exhibition and place a bid*. On Sunday 25th September, the bartering will take place and the audience will be able to take home amazing design pieces without spending a penny*. 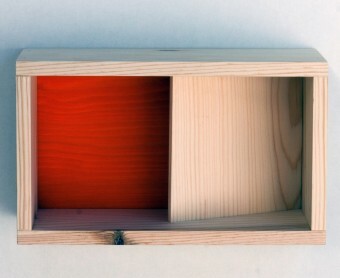 Alex Hellum is pleased to present a new prototype at 100% Norway 2010. 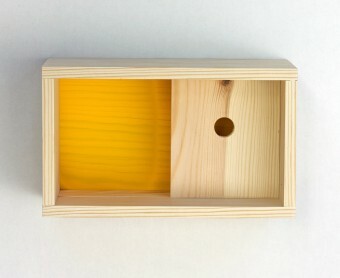 The prototype product, entitled Angle&Slide, is a wall-mounted storage unit made from untreated pine with a water based wood-stain. For High Resolution images please right click here. The design exhibition 100% Norway will once again showcase the best of Norwegian furniture and interior products during the London Design Festival at 100% Design, Earls Court, from 23 to 26 September. Building on the success of previous years, 100% Norway 2010 will showcase works of both established and up-and-coming designers, and feature a number of the country’s leading manufacturers. This will be the seventh time the exhibition visits London to act as a door opener for Norwegian designers and manufacturers to the British market and simultaneously build awareness of Norwegian design in the UK and internationally. Download a PDF version with images of this new story by right-clicking here. 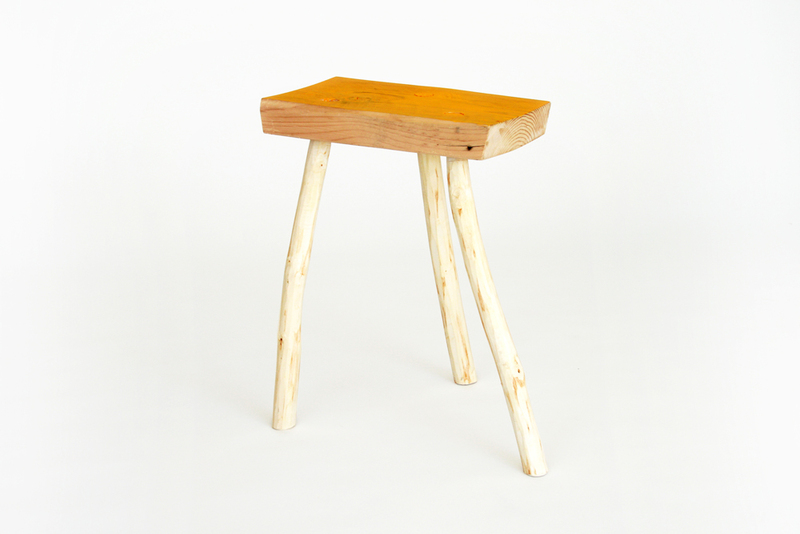 As part of the ongoing TEN project, Alex Hellum has produced a set of plans for how to make a three-legged stool. For high resolution images, please right click here. TEN is a collective of 10 designers who share a similar approach to design and who for the last four years have been presenting different projects around the theme of environmental sustainability in design. Now in their fifth year the TEN collective will be showing TEN PLAN, an exhibition of projects, which will be accompanied by plans and instructions for making. This project is as much about the journey as the end result. Alex Hellum has created a set of plans that will be available to download that detail the process of making a three legged stool. The plans include diagrams and instruction on how to drill holes at an angle into a piece of timber with a jig, how to whittle wood and how to adapt old legs to fit a new seat. A gentle, pleasurable project, Alex hopes that the process of making the stool will be as pleasurable as sitting on it. At TEN PLAN, Alex presents his version of the stool. TEN are Tomoko Azumi, Stephen Bretland, Carl Clerkin, Gitta Gschwendtner, Alex Hellum, Chris Jackson, Sam Johnson, Michael Marriott, Nina Tolstrup and Hector Serrano.